Congratulations to Reema from Strathfield! 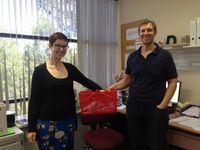 Reema has won a $50 Woolworths voucher for returning her Client Feedback Survey. TAD Disability Services values the feedback from our client to ensure we are meeting the needs of seniors and people with disabilities and their carers. Thank you to all those who take the time to share their experience so we can continue to improve our services. Our Development Officer Ann and Physiotherapist Brendan drawing the winner.